framework for this is in place (via http://www.calcudoku.org/ops/buybook)). Solutions to all puzzles (except the first 10 "warmup" ones) can be submitted for points (12 each) on the site. If you got the book, can you leave a review? I am sure you have observed that puzzle number 34 (exponentiation, page 64), A3E4, is indicating (below) 10x10 puzzle, while it's a 9x9. And puzzle number 109 (variations, page 156), A3V9, is indicating 8x8 puzzle, while it's a 6x6, so you have small corrections for the next edition . 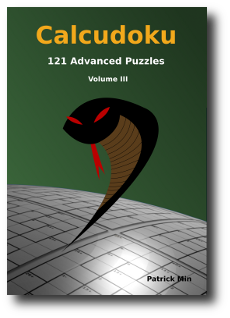 It's a very advanced book, wonderful, some puzzles are really difficult. Hi, frederick. In general, the difficulty has a subjective component, of course (I have not finished solving all puzzles in the book yet, around the 70%). I do not think the wide puzzles or the variations are the more difficult. However the large modulo, from zero and no-op could reach a really high level of difficulty. A 10x10 no-op is a typical example of a really difficult. Let's think, for instance, that a "simple" 3-cell cage "4" has: as sum [1,1,2], as product [1,1,4] and [1,2,2], as division [1,1,4] again and [1,2,8], and as a subtraction: [1,1,6], [2,2,8], [3,3,10], [1,2,7], [1,3,8], [1,4,9], [1,5,10], [2,3,9] and [2,4,10], so 13 different combinations. This is only my opinion (for the moment) with respect to this book.